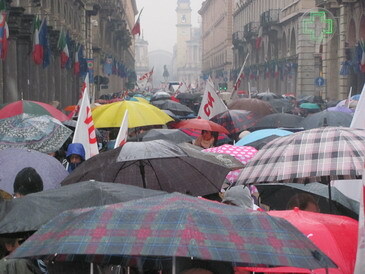 The “no-tav” movement demonstrates in Turin against that judiciary action with a march of about 10 thousand people. Saturday 28 January 2012, two days after the police blitz in which 41 no-tav activists were arrested or subject to precautionary measures, the “no-tav” movement demonstrates in Turin against that judiciary action with a march of about 10 thousands persons. The demonstration was already planned but tought to be a small informative action, intended to illustrate the damages caused by the building and the militarization (its title was “take back your rubbles”) and not suposed to interrupt the normal city activities, but after the arrests priorities have obviously changed. After bringing solidarity to the ferrotel workers’ garrison inside Porta Nuova Railway station the march proceeded in Roma Street (the most prestigiuos streeet of Torino) to the Castle Square, where the regional administration building is, and then on Po street (another shopping area). Other solidarity demonstrations took place in other towns such as Mestre, Livorno and Naples, where the high speed railway have been blocked by protesters (photo here).